WAIPA IN REAL LIFE: MY AWESOME TRIP BACK HOME TO BIG ISLAND, HAWAI'I... CHEEE-HUUU!!! MY AWESOME TRIP BACK HOME TO BIG ISLAND, HAWAI'I... CHEEE-HUUU!!! I ENJOYED MY TIME BACK HOME IN THE ISLANDS, IT WAS TO SHORT BUT I MADE EVERYDAY COUNT!!! SO LETS BEGIN THE JOURNEY!!! LEAVING BETHEL, ALASKA AND SPENDING THE NIGHT IN ANCHORAGE, ALASKA WITH DENISE & VANG!!! MY AWESOME CO-WORKER, RANDI MAKING SURE I BOARD THE JET!!! ANOTHER AWESOME CO-WORKER WHO IS ALSO TRAVELING, NICOLAI. AS SOON AS I LANDED, I WAS CRAVING FOR KOREAN FOODS, AND THAT IS WHAT I GOT!!! SEAFOOD PANCAKE AND KALBI FOR ME!!! MY SISTER, DENISE EATING AWAY!!! I WAS SO FULL FROM EATING AND WENT STRAIGHT TO BED AND SLEPT THE ENTIRE NIGHT!!! I WOKE UP THE VERY NEXT DAY AND HEADED BACK TO THE AIRPORT TO CATCH MY FLIGHT HOME TO HAWAI'I NEI!!! MY LONG TIME GOOD FRIEND, GEORGE AND HIS BEAUTIFUL WIFE FLYING WITH ME TO HONOLULU AND THEN THEY'RE HEADING OFF TO MAUI WHILE I HEAD OVER TO HILO, HAWAI'I!!! HOME SWEET HOME WITH MY KAHEALANI!!! AND MY BEAUTIFUL NEICE, HAWEO!!! THE NEXT DAY I HEADED OVER TO KONA SIDE TO GET SOME INKING DONE!!! HOWEVER, I DID RUN INTO A LITTLE SNAG... YIKES!!! YUP... I GOT A SPEEDING TICKET, IT HAPPENS FROM TIME TO TIME!!! BRADDA CHE DOING WHAT HE DOES BEST!!! "MOVING FORWARD" IS WHAT IS INKED ON MY RIGHT SHOULDER AND TRICEP. 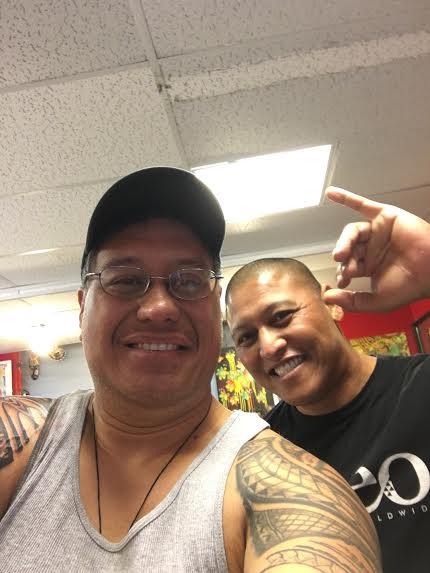 ONCE AGAIN BRADDA CHE, I'M SO GRATEFUL TO HAVE YOU IN MY CIRCLE OF OHANA, YOU'VE ALWAYS GIVE THE BEST INK EVER THAT WILL STAY WITH ME FOREVER. I CAN'T WAIT TO SEE WHAT'S NEXT FOR ME WHEN I RETURN!! !